We tend to do most of our usual grocery shopping at Walmart. It’s not that I’m a huge fan, but there are a few things that make Walmart attractive for families. Low prices and everything all in one place makes it hard to beat. Some of the other grocery stores have added other things like diapers, toilet paper, shampoo, etc… but they just don’t have the selection and prices that Walmart has. At the same time, some of the retail chains like Kmart have added some groceries, but again just don’t have everything we need. Walmart has it’s problems, however. In our town, it’s known for attracting freaky people. If you want to see all kinds of piercings, tattoos and odd clothing styles, Walmart is the place to be. Our store also seems to be bad about running out of one particular item. Not necessarily one brand, but all of the item. Tonight I think it was dry noodles. The shelves were almost completely picked clean of every brand and width of noodle. Sometimes it’s bread. Once it was cheese. It’s as if the person ordering just completely forgot to order that section. We had a horrible cashier tonight. I’m not sure if she was half-asleep or stoned. She kept trying to make small-talk with us, but she was so out of it that we couldn’t understand her. She was also one of the cashiers that don’t like to use the automatic conveyor. They leave it off and reach for items until they can’t reach any further, then they finally hit the switch to bring things closer, and then turn it off again. This has the side-affect of keeping me from unloading my cart right away, which means I can’t get to the bags quick enough. If I can’t get to the bags, she runs out of room until I can start putting bags in the cart. Since the cart isn’t empty, I can’t do that…. You get the idea. So, our cashier wouldn’t use the conveyor. She was also the slowest cashier that I’ve ever seen. I could have added the prices up on paper faster than she scanned things. It also took forever for her to put the stuff in bags. When she scanned the eggs, for some strange reason she stacked them on the corner of the scanner. Then she almost knocked them off on the floor. She started to put them in a bag, and then after she had 3 dozen in the bag, she tried to put in the 4th. Since that one wouldn’t fit, she had to take it and the 3rd back out to put them in another bag. Apparently the bags needed to be tied shut for some strange reason. She double-bagged almost everything else, which took ages because she couldn’t get the bags open. If you need a job, apply at Walmart. Apparently they’ll take anyone, no matter how bad they are at their job. What is so hard about a 4-way stop? We have a 4-way stop here in Quincy at 48th and State that has gotten some attention recently because it gets pretty congested at certain times of the day. Basically the local community college combined with normal traffic patterns of people going back and forth to work can slow traffic. Congested, however, is a relative term. Driving 25-30 mph for 20 miles in a work zone outside St. Louis is congested. When there is a wreck in that traffic and everyone has to funnel into fewer lanes, that’s congested. Having to take your turn in a line of maybe 20-30 cars at a 4-way stop is a minor annoyance at worst. Apparently this “congestion” is just too much for people. It’s so frustrating to them that they lose the ability to drive. Tonight traffic was a little slower than usual, due to the aftermath of an accident. Someone managed to t-bone a little SUV hard enough to not only dent the rear passenger side, but break the suspension bad enough so the wheel was up against the frame. How hard is it to navigate a 4-way stop? Wait your turn, proceed with caution, stop if someone is being an idiot! How fast can you possibly be moving after stopping at the sign? I’m guessing this bonehead had to pretty much gun it to cause that much damage. The problem with the intersection isn’t the cars, it’s the people driving them. I’m not going to name names here, but if you’re running for office and touting your teaching history, PLEASE spell-check your website. Can Illinois government be any more stupid? At first I thought it was a joke. At least it sounded like one. Yes, our bonehead Illinois government has passed a law to cover the regulation of hair-braiders. Apparently the business of hair-braiding was out of control in Illinois. I’ve always thought the whole barber license thing was a complete joke. It’s an obvious scam to collect fees from people so the government can spend more money on social programs. Not enough money to spend? Regulate something else and charge license fees. This time it’s hair-braiding. What will it be tomorrow? A license to mow lawns? How about a license to clean houses? With the liberals in charge, what part of our lives will the government NOT be involved in? Remember November, people! We’ve got to stop this insanity before it gets any worse. Yes, the darn little critters are back again this year. I’ve already gotten bitten twice – once on my scalp and once under my right ear. The little buggers sure cause a big swelling, especially on my scalp where the swelling has nowhere to go but out. It lasts a long time too, lumped up and itchy. The common solution around here in west-central Illinois has been vanilla. Never tried it myself, but that’s what everyone says to use. This year someone told me to pick up some Buggins at the local Gamemasters store. I’d never heard of it before, but here it is: Buggins Vanilla Mint & Rose. Based on that, I’d say people were on track with the vanilla home-remedy. 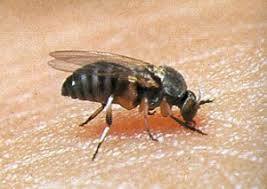 Apparently the buffalo gnat is really a black fly. Blood-sucking little disease-carrying vermin. Get your Buggins or vanilla extract or whatever bug repellent you like – these things can spread disease.